At 18 months old the real dolly fun can start because so many more products have been tested and are considered safe for children from this age. There will be lots of role playing happening by now as children begin to copy their carers, so a baby doll that will allow him or her to pretend to be a mummy or a daddy will be a lot of fun for them. Remember that many of the dolls featured in our guide ‘The best doll for a 1 year old’ will still be suitable such as the rag dolls by Bonikka. 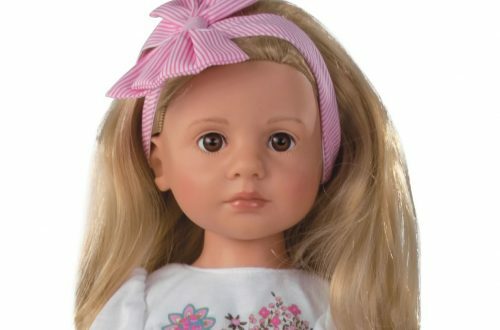 But in this article we are going to concentrate on baby dolls because I believe that the majority of children (not all) prefer more realistic looking dolls and vinyl dolls look much more real than fabric dolls. Always purchase a doll that is recommended for this age group, that is clearly marked with a CE mark and also an 18m+ or 2+ mark. If the doll has a warning that it is not suitable for under 3s then it is inadvisable to choose that doll. The doll needs to be small in size and not too heavy. The ideal length of a doll should be no longer than the distance between the child’s elbow and the tips of her fingers and this is generally around 30cm. That way the doll can be easily cradled in the child’s arms and won’t be too heavy or awkward to be carried around everywhere. They might even fit in a handbag if needs be too! The doll should be soft bodied. Children love to cuddle their dolls at this age and take them off to bed with them. Snuggling up to a hard plastic doll doesn’t sound very appealing! The soft body also allows the doll to be moved easily making dressing the doll easier and it is also easier to place the doll in high chairs and pushchairs etc. The construction of these dolls by all the various manufacturers tends to be the same. The bodies, including the top portions of the arms and legs, are made from fabric filled with new polyester fibre. The vinyl limbs are then sewn on so that they are floppy. There aren’t any joints that have to be manoeuvred, which is a good thing. Soft bodied dolls are also lighter in weight than all vinyl dolls. Children just love eyes that close so that when they put their baby to bed, it goes to sleep. If only it were that easy with all our babies! You might also want to consider the accessories that are available to complement the doll and enrich the play experience. Corolle are particularly good at producing sets that allow a little parent to feed and care for their baby. Children do seem to love carrying their dolls around and I think soft fabric carry cots make a lovely add on. 6 Can it go in the bath? There is one more thing that you are possibly contemplating, whether or not to buy a doll for the bath. I think the dream doll has yet to be found that can be loved and cuddled during the day, bathed at night, dried off and cuddled all night in bed. Rosie and I have tested all of the various makes of bath dolls and none of them can do this. Drying takes a long time. Fabric bodies, although quick drying, still take hours if not days to dry off, and all vinyl bodies always fill with water and this can dribble for days too. I would whole heartedly recommend buying a doll to play with during the day and a specific doll for playing with in the bath. So which brands do I recommend for children of 18 months or 2 years old? Corolle dolls are designed in France and made in China and Europe. The faces of all their dolls are based on real babies and the quality that Corolle achieve is brilliant. The clothes they come in are beautifully designed and made, as are all of the accessories available. They do have a scent of vanilla, which some people don’t like, but I have to admit to loving it as it is made from actual vanilla and isn’t over powering. Corolle’s range that is aimed at children from 1½ to 3 years old is called Mon Premier, or My First. There are always several Mon Premier Calin soft bodied baby dolls available and the best seller every year is Calin Charming Pastel. (Pictured above). She is a 30cm soft bodied doll with a pretty face, closing eyes and is dressed ready for bed. (She is pictured with the little blonde girl at the top of the page). Every year there are always several other Calins to choose from with varying outfits, eye colours and face sculpts. Since writing this guide Corolle have introduced some Mini Calins which are great for taking out and about as they easily fit in a handbag. There are a few clothes but no accessories for this range which you can see here. Corolle is Petalina’s favourite brand for children of this age because of the quality, beauty, accessories and clothing available. Kathe Kruse design all of their dolls and accessories in Germany and everything is made in Latvia. Those of you who read my ramblings often, will already know that I have a passion for all Kathe Kruse dolls. The hand painted faces, the beautifully designed clothes, the attention to detail and the gorgeous fabrics used, all contribute to the creation of really beautiful dolls and clothes. They are a little more expensive than many other brands but with production and transportation costs going up in China the gap isn’t so great anymore. And when you hold a Kathe Kruse doll in your hands you know where your money has gone. They are the Rolls Royce of the doll world. After a few years of trying to establish a way forward for this beautiful brand of dolls, they are increasing the ranges of the Mini Bambina dolls, their dolls clothes and suitable accessories. If you like to pay extra for something really beautiful and high quality, then this range is for you. Mini Bambina – have vinyl heads and limbs with a chubby and cuddly body. The rest of the body and limbs are fabric and their clothes are removable. These are our most popular baby dolls by Kathe Kruse and are exquisite. See Mini Bambina Emmi above. Puppa – these lovely 36cm dolls have hand painted vinyl heads with pretty faces and blue eyes. Again, Kathe Kruse are extending the range available of these gorgeous little dolls and now have clothes available. Bath Babies – these are all vinyl dolls that can go in the bath or swimming pool for up to an hour at a time. One of these sweet little dolls helped my daughter learn to swim. See Bath Baby Trixie above. 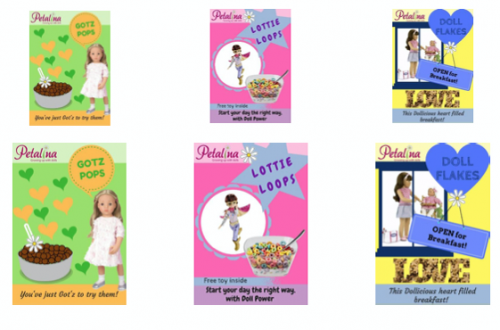 Gotz is our most popular brand of all but until very recently, none of the dolls we offer were recommended for 18 months and up. This has now changed and they have a small selection available for this age group. Mini Muffin – these are 22cm soft bodied baby dolls with painted faces. Pefect for taking everywhere because of their compact size. Dolls in this range with hair are also safe for this age group. Muffin – the perfect sized baby doll for 18 months up to 3, these little dolls are great quality and there is a good selection. Just the baby dolls without hair are safe from 18 months. Maxy Muffin – these are 42cm cuddly baby dolls and there is one doll in this range that is safe, for those children who love large dolls. Remember the small size of some children will make carrying this size of doll difficult. Aquini – the small size of these bath babies with painted faces are safe from 18 months old. A selection of Gotz baby dolls. Maxy Muffin 42cm, Muffin 33cm and Mini Muffin 22cm. Petitcollin is a French company and many of their dolls are still made in France. The outfits and accessories tend to be made elsewhere in Europe and Tunisia, with shoes and plastic accessories being made in China. Ecolo babies – these are tiny baby dolls at 25cm which have been made using organic fabrics and other plant based materials. Safe from just 10 months they come in a matching bag and card box which can be used as a bed. Mini Minouche – these beautiful dolls designed by Sylvia Natterer have joined the Petitcollin range for 2017. Fanny is suitable for 18 months and up and is the perfect size. Schildkrot, a company that still makes dolls using traditional methods in Germany, also make some gorgeous 33cm baby dolls called Schlummerle, and the baby dolls without hair are usually tested for 12 months+. Be careful if you look on their website because many of the dolls they now make available are made in China, but as a retailer we were only offered the dolls made in Germany to sell. Hopefully you now have a few more ideas about which dolls are suitable for your little one. We do have baby dolls other than these ranges above, but they don’t have dolls available for 18 months to 2 years old, or I feel they aren’t of the same quality as the brands recommended above. Please note that the baby dolls made by Llorens and Antonio Juan babies are NOT safety tested for this age group – they are all age 3+. Due to the way they are made they are NOT suitable for children under the age of 3 so please don’t be tempted. My daughters birthday is coming up and I’m wondering if your shop still sells „Olivia little muffin gotz doll“ ? Hello Doreen, thank you for your comment. Sorry I’ve taken ages to reply but have been away with no access to my blog. I’m afraid we no longer sell anything as I closed the shop at the end of March, having had enough of the competition and the stress. Gotz now sell an awful lot of their range on Amazon (so sold by Gotz and fulfilled by Amazon) and Olivia as we used to call her is here. Gotz don’t give them names. Just wanted to say thank you for this very helpful post! Sorry to read above that you aren’t selling anymore – online can be tough.